The Make2D-DB II query interface is the entry point from which users and database managers access the potsgreSQL databases and related documents. Beside being an interactive interface to address queries, it offers many other features. It has the ability to manage simultaneously several local databases/projects, but also to contact other similar interfaces addressing queries on many resources all at once. Moreover, it can be used in non interactive mode as an extractor for data and objects (maps, gels, spots, experimental results, etc..) and export them in different formats, thus acting like a data repository. The extracted data can then be read by humans or integrated in any other software or pipeline. The Apache ModeRewrite redirection is another included feature that makes queries (specially in non interactive mode) very intuitive. This tends to give data extraction an aspect of URI (unified resource identifier) object extraction. All the needed rules for mode rewriting are generated by the tool. When the server installation part is executed, all the needed scripts and documents are built inside your Apache server directories and your database is ready to be accessed via the Web. In some systems, you may need to preceed the server reference name by 'html': http://your_domain/html/2d, or any other prefix, depending on your server files location. You will be asked for a login ID, a password and a database name to access the interface. You should give your postgreSQLaccount login and password (password is required unless you set your postgres server to "trust" TCP/IP localhost connections). The database name is also the postgreSQL database name. You may logout at any moment. After 30 minutes of non-activity, your login will expire. The login data is highly *encrypted* and is time and system dependant (view1, view2). Rewriting redirection rules is not only a nicer way to display URLs within your browser, e.g. The main advantage, beside the intuitive way to formulate and extract queries, is that any object is clearly defined by its own URI (Uniform Resource Identifier). Then special actions: how to present the object, what actions to take, etc.. follow in in a very simple and intuitive formulation. By the end of your installation, you will find two generated files called respectively make2db_map.txt and mod_rewrite.txt. Those files are located in your database server directory ../cgi-bin/2d/inc (or similar - another copy from your last installation will be in the Make2D-DB temp directory). The first file, make2db_map.txt, contains the mapping functions that will be used by the Apache server. This file also contains a summary of the directives on how to include the rewrite rules within the Apache configuration file. The second file, mod_rewrite.txt, contains those rules that have to be included "as is" within this Apchae configuration file. You should copy all the instructions given in this mod_rewrite.txt file to the end of your Apache httpd.conf file (usually in /etc/httpd/conf/httpd.conf) and restart your server (you should have permissions to do so, or ask your system administrator to do this task). You should verify that the Apache httpd.conf file has an instruction: "LoadModule rewrite_module modules/mod_rewrite.so" or equivalent, then activate the line "RewriteEngine on" within the same file by omitting the '#' character it may have at its beginning. For more information, have a quick look at the Apache Module mod_rewrite page. Contact us if you happen to encounter any problem setting this mode on. Data defined to be private during the installation process (or at any later moment using the administration interface) will only be accessible to adminstrators. If you have set a value for the $private_data_password variable in your configuration file 2d_include.pl, then users may also access those data by entering the appropriate password from the main interface home page. A button labeled 'Private data' is located at the bottom of the home page. Once activated, it remains active in the browser for 30 days. Users have the choice to deactivate their access at any moment. During the installation process, external up-to-date UniProtKB data should have been already integrated within your data. Other external 2D resources may also be contacted to establish links between your database and their data. This operation is not launched by default during the installation process. Instead, you should select "Managing External data" from the management interface and then choose "Update external 2D data". You may re-execute such updates (as well as for UniProtKB data) from time to time, to make sure your data is always synchronited with those external resources (automatisation with a 'crontab' is to be considered). 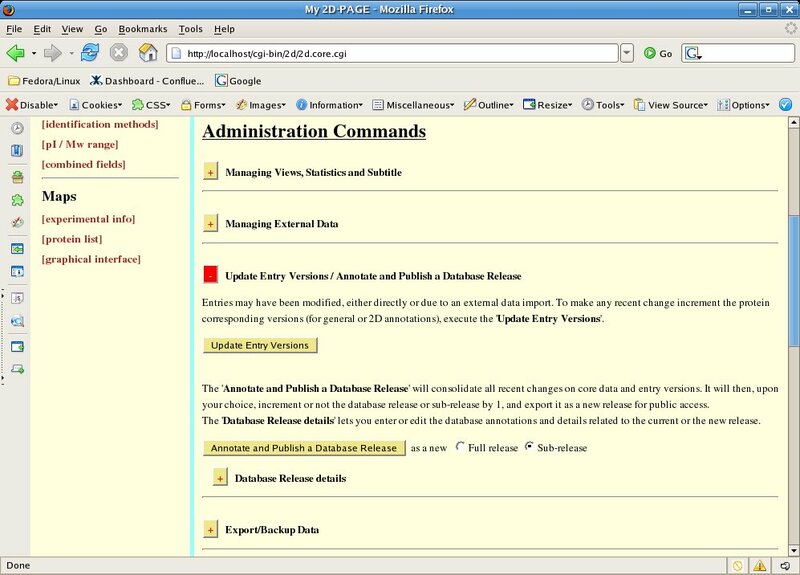 A more detailed description of the management (administration) interface. Currently, there is a fair description of each operation within the interface itself. Please, do not hesitate to contact us if you have any question about any of those operations. A detailed list on how to extract any type of object or data from a database, in both normal and Mode Rewrite modes. How to extract local database/project list, protein indexes to link with, maps' list, species list, how to link to a Make2D-DB II repository, etc..